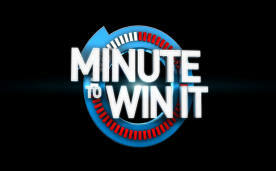 This event is fun, energizing, challenging and is guaranteed to produce a lot of laughs..
Corporate Minute to Win It gives teams one minute to complete a challenge in order to receive much need points. If you are looking for an event that is light hearted, inclusive and your team will remember then this is the event for your next team building event. There is not much time to adopt a strategy. Just get on the floor and do it. Corporate Minute to Win It is best played indoors but is ideally suited to outdoors if required. Suitable for teams of 6 to 200. "What a great time. The Minute to Win it activities you ran were ideal for our team. Especially since there were varying ages and abilities. It was also great to see everyone mingling too. The night was a complete success and would recommend you for future events.